TriXtan's award winning magic entertainment combines magic, sleight of hand, comedy, circus, escapology and grand illusions to create a powerful performance with a little something for everyone. An exciting, family friendly and interactive show that will leave you on the edge of your seat and truly amazed! For more information, please see TriXtan's website. Richy Roy is an expert entertainer that has thousands of on stage hours with performances all across Western Canada. Each show is tailored for each specific event with the client's need in mind. His amazing manipulation skills, quick wit of clean comedy, and dazzling magic routines is sure to please all crowds large or small. Richy frequently performs for all types of events including corporate events, fairs and festivals, private parties, and fundraisers. Hurry up and call 306-861-2201 to book your show today! Magic Mike specializes in magic shows and workshops for children's Birthday parties as well as Magic shows and close up Walkaround magic for Corporate family events & parties! Magic Mike Magic offers several Birthday show packages to suit most budgets. His shows are customized to the age of the children (Pre-school age & up) and include exciting magic effects (of course), music, humor and lot's of audience participation. For Children ages 7 & older - In addition to Magic Shows Mike also offers a Magic 'Wizard's Workshop'. This is a real confidence-booster where all of the participants learn (and take home) several magic effects as well as some of the important secrets to becoming a real entertaining performer! Mike's goal as a professional entertainer is to create a MAGICAL & MEMORABLE entertainment EXPERIENCE by combining exciting effects with music, humor & lots of audience interaction. Based out of Calgary, Alberta, Yeats Magic Co. brings you an innovative and unique magic experience! Specializing in stage magic for corporate events, Yeats' approach is to offer you a variety magic show, by utilizing the best of local talent. Yeats can bring you a 3-man show, 1 man show, or even a full 2 hour troupe of magicians, depending on your budget. Yeats bring you international award winning magicians, illusionists, and manipulation artists. If he doesn't have the right show for you, he can refer you to other magicians, free of charge. As President of the Calgary Magic Circle, Yeats also has a huge network of local contacts, and is happy to provide you with advice on picking the perfect show for your event. 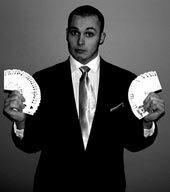 Magician Henry Parker has been operating as Miles of Magic™ since 1991. Known as one of the foremost children's magicians Henry has made thousands of young people smile and laugh. In fact, thousands of children of all ages have enjoyed his performances. The many different venues include: adult banquets, childcare and daycare centres, corporate shows and staff associations, community shows, family reunions, fundraising events, home private parties, libraries, magic camps, private dinners, restaurants, schools, senior centres, special needs groups, weddings. Henry performs mingle (walk-around) magic, parlour magic and stage magic. Balloon animals (balloon twisting) are included as part of the magic event or as the main activity. Using a wide repertoire of magic effects Henry ensures that his magic shows, walk around magic and camps are age appropriate and meet the needs of the client and the venue. Seriously funny magic is about blending laughter with the kind of effects that leave your audience talking long after it's done. Edmonton based magician David Thiel has been the featured performer at festivals, trade shows, hospitality suites and corporate events all over North America. His close-up magic will leave you spe echless...and his family stage shows are designed to delight the adults as well as the children. Clients book him again and again to bring his lightning wit and accomplished magical skills to their event. Ask about David Thiel's "Rock and Roll Mentalism Show" for something completely different! David dares to go where other Mentalist fear to tread. From the unusual to the bazaar, David is sure to raise the hair on the back of your neck. David is available for company parties, social and charitable events, restaurant and lounge work. Robert Wong presents clean, family, corporate entertainment to make your next special event unforgettable. With over 30 years of experience, having been featured on television, newspapers and magazines, Robert provides worry free entertainment that will appeal to everyone! Don't hire the ordinary, hire the extraordinary, Robert Wong Magical Entertainer. 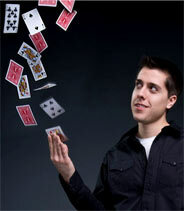 Scott Baird is an award-winning magician who specializes in close-up magic for corporate events and special occasions. An expert of sleight of hand, Scott can perform amazing magic with little more than a deck of playing cards, a few coins, thimbles, and everyday objects. At your next corporate trade show, Scott will make your booth stand out. His magic can be tailored to push your brand, and be personalized with your business' logo. Acting as an ambassador representing your business to your potential clients, he will draw a crowd and give them something to remember your business by. Magic is the perfect ice-breaker to bring your two families and groups of friends together on your special day, while providing your loved ones the perfect conversation starter. Scott's magic will not only help bring everyone together as one happy family, it will also help your wedding day run more smoothly. He can entertain your guests at all the quiet points of the day: during the picture-taking, before the banquet, and in between courses, providing a feeling of continuity. Ideal for cocktail parties and smaller groups, a close-up show includes magic with small props such as cards, coins, rings, thimbles, ropes, and silk handkerchiefs, to name a few. It is most common for a magician to specialize in the use of one or two of these props, however, Scott is a master of all. His rope routines look like trick photography, and his coin work is unrivalled. This intimate type of magic is highly visual, and adaptable to any size of group or performing environment. This magic is perfectly suited for family reunions, cocktail parties, anniversaries, and any other excuse you can find to throw a party! I have been performing magic for five years and there is nothing I enjoy more than learning a new effect and showing it off to my family and friends. I mostly deal with card magic, but I am very well known for other effects as well. If you like amazment at your local pub or restaraunt I am able to take your guests to another state of reality for a short time I like to take borowed objects and do strange things with them like taking a quarter and placing it on a glass table having the spectator put their hand on the other side of the glass I rubb the coin and it passes through the solid glass and falls into the spectators hand. I also do this with cards I am able to make things levitate as well as my self on occation. I can place an object like a coin in your hand and make it vanish or change to another object just by waving my hands slowly over the spectators without touching them. Take a pop corn kernal place it in their hands wave my hands over and it pops in their hand without touching it. I can place a coin or a cigarette in their hands or a match many small items and have them concentrate to move the object. Feel free to have me come by your establishment to give you a taste of some of the things i am able to do to twist yours and your guests reality. They will remember the crazy stuff they say that night and come back for more. Corporate Entertainer, EVERETT ANDREWS "Master of Mystery" is unsurpassed as an International Award Winning Family Entertainer. His Stage and Floor Shows have always been a crowd pleasing hit, that have a reputation for excellence! Do Not Be Fooled, by just any magician that does a bunch of tricks...Engage EVERETT ANDREWS and be ENTERTAINED! Why settle for anything less? So, whether it is the "Master of Mystery" show for a sophisticated, corporate audience or the "abraKIDabra" exciting children's show with "The Magic Prince"... You come out a Winner! The shows are interactive, fun-filled with exciting, wholesome, quality, audience participation. Alberta's most requested Family, Magical Entertainer. Kent Wong is an Edmonton magician who has been astounding audiences for over 35 years. His unique brand of magic and humor has made him one of the most sought after corporate and tradeshow entertainers throughout Alberta and Western Canada. From strolling magic to banquet acts and grand scale illusions, Kent has done it all. He’s just as comfortable entertaining a small group of employees as he is in front of 2000 corporate executives. Kent’s unique sense of artistic style is what sets him apart from everyone else. Imagine taking a 6 foot, French guillotine and turning it into one of the most entertaining card tricks you’ve ever seen. Imagine escaping from a straight jacket while someone aims a loaded paintball gun to your head. Now imagine this kind of controlled chaos taking center stage at your next event! If you’re looking to make your next event an overwhelming success that will be remembered for years to come, Kent Wong is the Magician for you. To find out more about Kent, please visit his website or contact him directly at (780) 907 - 6273. Magician Randy Burtis has been performing across Western Canada for over 15 years. Now based out of Grande Prairie, Alberta he brings his show to the area. Perfect for Birthdays, School and Library shows, Christmas events, Church programs and more. Family friendly entertainment full of magic and wonder. Visit www.magicandwonder.com for more info! I am from HongKong and i new in Canada, Hope to meet some new magical friends in this nice city. 20 years experience in magic. especially in Cardmagic. A pat on the back, A thank you hand shake, this is what you will get from you Boss or co-Workers after seeing The Comedy Magic of Brent Smith. From the Deerfoot Inn and Casino, Stampede Casino in Alberta to The Golden Eagle Casino in Saskatchewan...Brent Smith knows the secret of making people of all ages laugh. Voted Time Magazine's PERSON OF THE YEAR 2006, Calgary Alberta Canada is home of Award Winning Comedy Magician Brent Smith and he can provide a 30 or 60 minute Comedy Magic Show that includes Stand up comedy as well as Belly Rolling, eye tearing Comedy magic. Each show is customized to the client's wants, needs and budget. From squeaky clean to Adult Comedy, Brent takes into account everyone in the audience. He also owns The Vanishing Rabbit Magic Shop in Calgary which Guarantees his valuable clients the Best and most recent in Magical Entertainment. Justin Morris has been performing magic professionally for more than five years. At an early age, Justin’s interest in magic began, and as the years went on, Justin has developed his skills and has been driven to grow and learn in this area. Justin worked for three years at Moxies Classic Grill in Canada’s largest mall, West Edmonton Mall, performing for customers, caring for tables, and performing for customers as they waited to be seated. In 2006, Justin took his magic to the competition level and won his first award at the Battle of Alberta Magicians Convention. Justin enjoys performing and entertaining his audiences with his classic and friendly style that puts his audience at ease. Audiences will be astonished by sleight of hand and illusions in a lighthearted performance that will leave them entertained and puzzled. Justin has performed for clients such as the University of Alberta, Government of Alberta (Alberta Registries), and Edmonton’s Hope Mission Tegler Community Center and many more. Whether your function is a meeting or a celebration, Justin will provide professional magic that will suit your event needs and budget. Have you ever seen metal bent with the power of the mind? Join Eric as steal takes on a life of its own. Eric mixes up his metal bending with other favorites, including turning a spectator into the magician! Clean performances for birthday, schools, and corporate events. Eric's clients include The Calgary Catholic School District, RBC, Denny's Restaurants, & more! All shows come with a money back guarantee! International Award Winning Magician Trent Tinney performs Educational Programs and Entertaining Comedy magic. Providing quality performances for all your school, family and corporate needs. Trent began performing magic when he was 18 years old and loves the Art of Magic. Trent works closely with schools and corporate clients to make every event a success. Billy Kidd is one of the few female magicians in the world. Her unique style and charm is sure to entertain at any type of event. 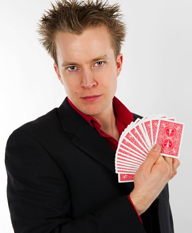 Billy has performed walk-around, close-up magic and stage in Canada, USA, Japan and the UK. Based in the Uk and Canada she travels the world to make your event a success. "Kyle Key The Magician IS NOT FOR EVERYONE. Side effects may include excessive laughter, Porphyrophobiamentalisim, confusion, paranoia, problems sleeping, momentary turrets, and in rare cases, temporary psychosis. Performing corporate shows for the past decade, Kyle Key has traveled Western Canada with his award winning talent. Including comedy, originality and LOTS of audience involvement. Call Kyle today to reserve your free quote!" Astounding audiences world-wide with his unique styles of entertainment, Paul makes your event one that your guests will talk about for years to come. Unlike any other show you have ever seen before! Combining unbelievable magic and death-defying escapes, Richard Sherry and Dayle Krall deliver an extraordinary experience. Watch as Richard saws Dayle in half with a chainsaw and Dayle tests fate in the Chinese Water Torture Cell. Bewildering audiences of all sizes, the magic and escapes of Richard and Dayle can be tailored to fit your unique needs from the smallest private party to the largest stage. Enjoy audience participation, live animals and infectious humor. From the inconceivable magic and illusions and the impossible escapes to the beautiful, colorful costumes to the engaging music, the Richard Sherry and Dayle Krall stage show is perfect for your next event. Richard and Dayle are an unbeatable team bringing you an unforgettable entertainment experience.